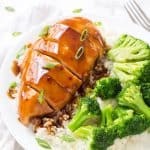 This Easy Baked Teriyaki Chicken is the perfect weeknight meal! Juicy and tender chicken breasts are baked in this incredible homemade teriyaki sauce. So simple and incredibly flavorful! Teriyaki chicken is one of those things we do not make enough and we should! This teriyaki chicken sauce is to die for and is incredibly easy to whip together, only need 10 minutes from start to finish on the sauce. It’s so much better and more flavorful to make it homemade instead of purchasing a store-bought teriyaki sauce at the store. I like my recipe for homemade teriyaki sauce because it makes a lot of sauce. 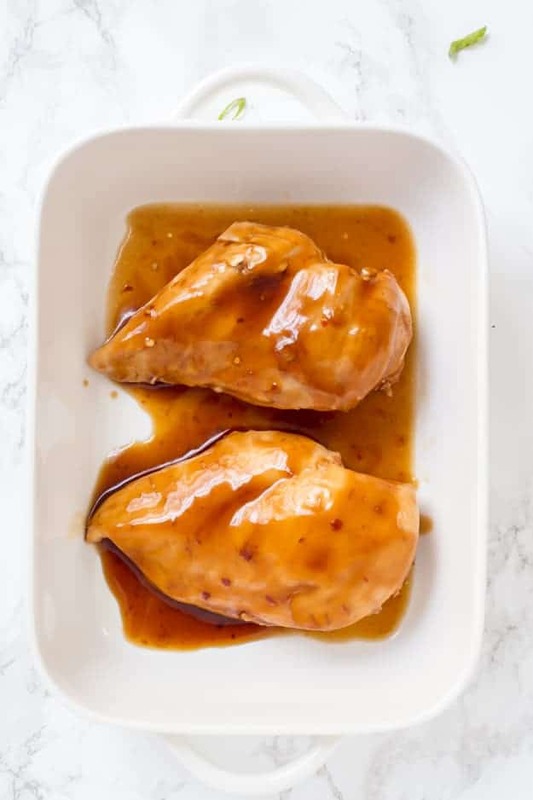 I love to bake the chicken breasts coated in the teriyaki sauce, and then I love to spoon extra on top of the chicken when serving. It gives the rice a nice coating of sauce, which is my favorite! If you are looking for a few tips on how to make your homemade teriyaki sauce, read below. If you love teriyaki chicken, I highly recommend trying my Easy Teriyaki Chicken & Pineapple Kabobs. They are perfect for the upcoming grilling season, and you can easily replace the store-bought teriyaki marinade packet with this exact teriyaki sauce recipe. So what sets this teriyaki sauce apart from the store-bought ones? For one, you know what the ingredients are and the quality of your ingredients, which is important to me. I like being able to control the sweetness and the sodium content in the teriyaki sauce. My family loves how this sauce isn’t too sweet, but it’s sweetened enough by light brown sugar. I tried it with granulated sugar before, and we enjoy the extra molasses flavor in the light brown sugar (so good!). When making teriyaki sauce, there aren’t a lot of ingredients. I combined all of the ingredients in a small mixing bowl, then poured the sauce into a saucepan over medium heat and allow it to simmer until it came to a boil. Once it comes to a boil, occasionally stir until the sauce has thickened to your liking. Keep in mind once the teriyaki sauce thickens even more once it has cooled completely. I told you it was easy! Reduced sodium soy sauce: I highly recommend using reduced sodium soy sauce instead of the regular kind because your teriyaki chicken would end up a little too salty. You can always add more salt, but it’s hard to take it away. Microplane your fresh garlic: Of course you can always mince your garlic cloves, but I like having smaller pieces of garlic in this teriyaki sauce. This is the microplane grater I use and love! Use red wine vinegar: You are more than welcome to use apple cider vinegar or even sherry vinegar if that’s what you have on hand, but I love the acidity in the red wine vinegar. Red wine vinegar balances and accentuates the flavors without adding additional salt. If you love juicy baked chicken breasts with a lot of flavor, you should give my Baked Cajun Chicken Breasts a try! Preheat oven to 450 degrees. Whisk together soy sauce, light brown sugar, water, crushed red pepper flakes, garlic, ginger, black pepper, red wine vinegar, and cornstarch together in a small mixing bowl. Pour the sauce into a saucepan over medium heat. Allow the sauce to come to a boil, then bring the heat to a simmer, occasionally stirring for 2-3 minutes. Remove teriyaki sauce from the heat. 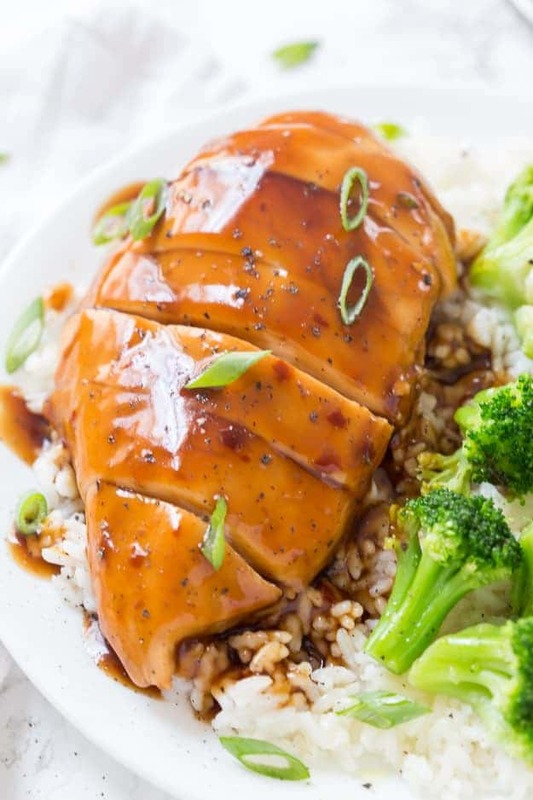 Place chicken breasts onto a baking dish and coat all sides of the chicken with the teriyaki sauce. Cover with aluminum foil and bake for 23 minutes. Remove from oven and allow the chicken breasts to rest for 10 minutes. 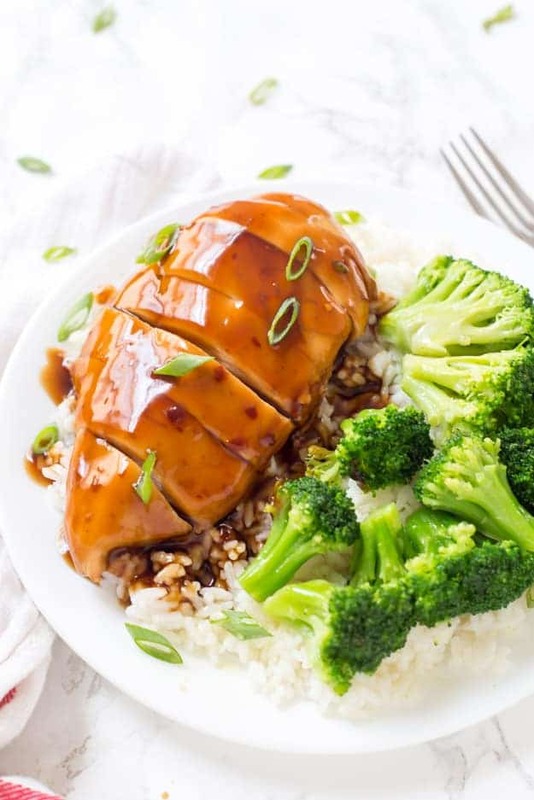 Slice chicken breasts, serve over rice with broccoli (optional) and spoon extra teriyaki sauce over the chicken and rice. Garnish with sliced scallions.